Before I tell you of the finest facial I have ever had in my entire life, I have to tell you the whole journey, being the linear-thinker that I am. I was supposed to be in New York tonight, seeing a private Adam Lambert concert, which would have been my favorite thing ever! I’ve loved that boy for much longer than most of you have ever heard of him, and I know him personally, too. So, when I realized that I had too many obligations here in LA to take the time off, (not to mention that my ailing back wasn’t cleared for flying,) I was so depressed that I knew I had to do something to cheer myself up. 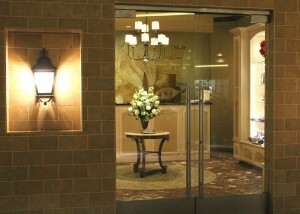 And what better place to go than for a day of relaxation and pampering at a Burke Williams Spa?! It was the correct choice; I was so relaxed all day, ( and through the ensuing night,) that I really couldn’t think of anything at all, including being sad that I was missing Adam! So, I have to share the experience with you guys. It seems like forever that that name has been synonymous with relaxing. After I first heard of the place, way back in the day, I didn’t hear of another spa in town for about ten years! It’s like calling “tissues” “Kleenex;” the name is just synonymous with the product! The entrance, which puts you at peace from the get-go. I cleared an afternoon to go, so then the problem was—which location? Shockingly, I’m about equi-distance from three of them in Southern Cal! I had already been to the ones in Santa Monica, (my first, ahhh,) and West Hollywood, so, always one for variety, I chose Sherman Oaks Galleria, to get a look at it. I think I liked this layout the most. The pleasantness of the staff is such a bonus. First, Tanisha got me settled, then Teresa showed me around. When I finished deciding just which attractive cold water to start drinking, (the one with oranges and cucumbers, the one with just ice, or from the pro machine) I decided to start with the big, inviting jacuzzi. I usually go in naked, but I saw a girl in there in a bathing suit, so, always wanting to go with the flow, I went back to my locker and put mine on. When she got out, I noticed she was naked, but had a tattoo on her back that I mistook for a bathing suit strap! When I finished feeling like an idiot, I moved on to the steam room. It was a really perfect one, and the ice cold face cloths made it extra comfortable. Then, just in case I hadn’t been in enough moisture for the day, I took a shower because the amenities in that area are so fun! When I got into my long, cozy, provided bathrobe, I sat out in the co-ed lounge for awhile, by the fireplace. I actually felt like I was back in Aspen for a bit, which is a wonderful feeling. At the appointed time, Roxanna Benson got me for my much-needed massage. She was wonderful. She felt where I needed deeper work, and gave it her all. My back has been a mess since I broke it, and she could tell where it needed the most pressure without my having to tell her anything. I don’t want to spoil every little surprise for you, but I must tell you about the several warm ones, like towels, heated sheets, and the best one–when I went to put my robe back on at the end, Roxanna had heated it up for me! After the massage, I was ready for a nap, so I lay down in the quiet room for awhile, where I wish I could have stayed overnight! Actually, if I worked nearby, I would just get a day pass to Burke Williams, take a jacuzzi and steam, and then nap in this room on my lunch hour! Or after work, to gear up for a big night out! My main purpose in going there this time was to get a massage, but I decided that I may as well get a facial, too. And I cannot express to how thrilled I am that I did. Hiromi Tozawa-Brown (love that last name!) gave me the best facial I have ever experienced, hands down! I’ve had tons of facials in my time, but not ever one as fabulous as this one!!! And, as Roxanna did, she seemed happy to be doing it! You just have to experience it for yourself, but if you ask the one thing that distinguishes it from all that came before, I’d say it was the face massage that accompanied it. Hiromi got my back, shoulders, and arms, too. I think my scalp and feet, too, although I could have just been hallucinating at the time because I was in such heaven. No fooling; as she escorted me back to the locker room, I felt like I was in a dream. Roxanna had given me lots of tips for the care of my finally-relaxed back, so I hit that jacuzzi one more time. And then, what else?, the shower again, this time to wash my hair with their coconut-aroma-ed shampoo. Maybe that’s what inspired me to sit down for a bit and avail my stomach of some of their fresh fruit that’s available at all times. I went nuts for the small apples! After awhile in the absolutely neat hair dryer and grooming area, I finally forced myself to get dressed and leave. [Note: I really wanted to take pictures of several areas for you, including that one and the fireplace, but, even though I would have obviously left the patrons out of them, the spa is very protective of their clients, so no photos are allowed. You’ll just have to see it all for yourself.] The girls at the front desk practically had to spin me around and point me in the direction of the elevator to the parking lot! I know they have other services too, but I wanted to save them for another day when I need more cheering-up. Hopefully for me, there won’t be many of those to come, but at least I know I always have Burke Williams just a few minutes away.